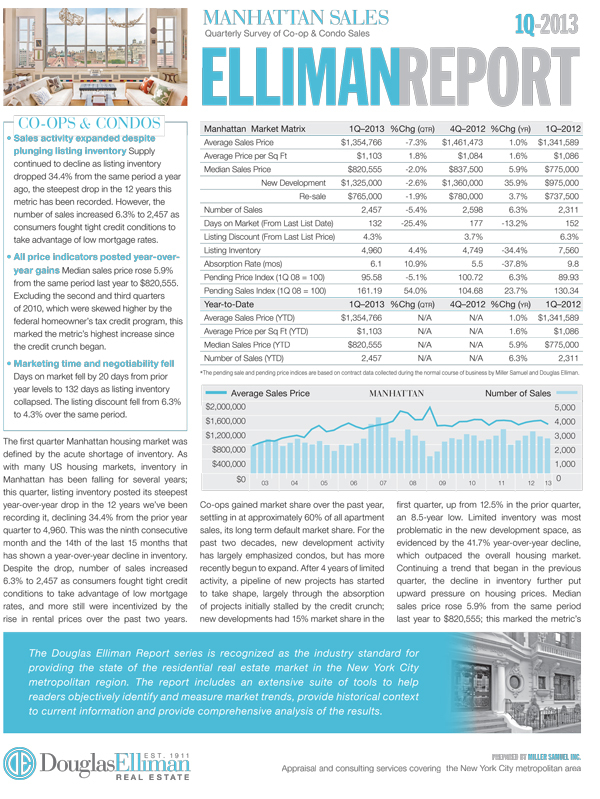 We published our report on Manhattan market sales for 1Q 2013 today. I’ve been writing this series for Douglas Elliman since 1994. -Inventory remained near historic lows, seeing the largest year-over-year decline in the 12+ years we’ve tracked it. -Sales increased despite drop in inventory – low mortgage rates and pent-up demand as key drivers. -All price indicators increased from year ago levels – largely due to inventory near historic lows. -Largest price increases since credit crunch began with exception of 2010’s federal homeowner tax credit era. -Days on market and listing discounts dropped as inventory declined. -Luxury market had slower rate of decline in inventory (about half) than the overall market. The charts and data tables are updated to include the first quarter of 2013. Here is some of the press coverage for the report today. You publish an excellent sales report packed with valuable information on the Manhattan Market. Our Luxury market had slower rate of decline in inventory as well but that is starting to pick up now in Orange County, CA.